Huawei is on a roll. After announcing the P30, P30 Pro and P30 Lite, a new smartphone has now been spotted at an online store in Russia. The Honor 8A Pro has been launched in Russia and revealing specifications, and pricing details. The smartphone is seen sporting a waterdrop-shaped notch, 6.0-inch HD+ display, 3GB RAM, Helio P35 SoC, and running Android 9 Pie. 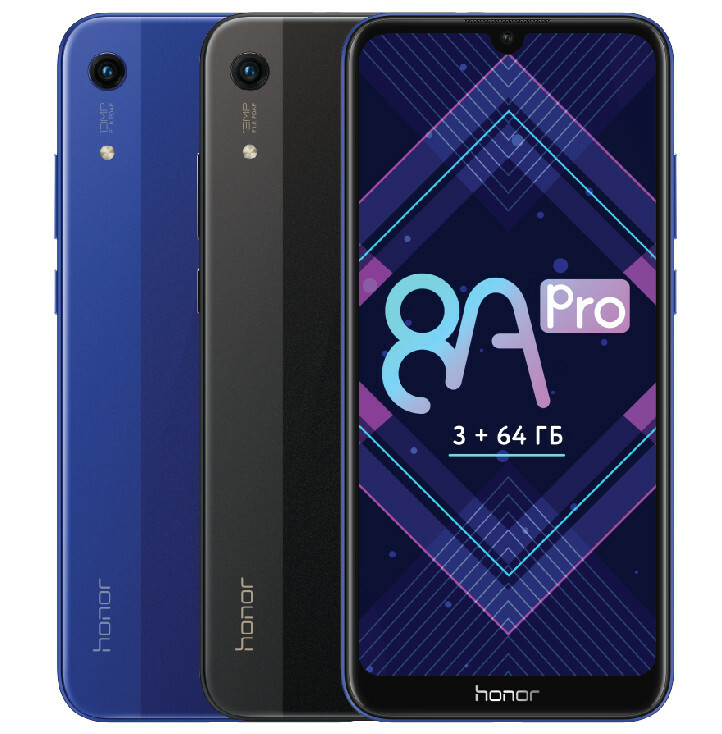 The Honor 8A Pro price in Russia has been set at RUB 13,999 – approximately $217 and the smartphone is up for sale. The device comes in Midnight Black and Aurora Blue color options. The Honor 8A Pro is seen to sport a waterdrop-shaped notch and a slight chin at the bottom of the display. At the back, there is a single camera with LED flash setup stacked vertically and a bottom edge is where the Micro-USB port, the speaker grille, and top edge with the 3.5mm audio jack, and the right edge is where the volume and power buttons sit. The device runs on EMUI 9.0 based on Android 9 Pie. The dual-SIM device sports a 6.0-inch HD+ (1560×720 pixels) FullView TFT LCD display. It is powered by the MediaTek MT7665 Helio P35 octa-core SoC paired with 3GB RAM. Inbuilt storage offered is at 32GB with the option to expand further using a hybrid microSD card slot (up to 512GB). Imaging wise, the 8A Pro offers a 13-megapixel rear sensor with autofocus, f/1.8 aperture, and flash support. Up front, there is an 8-megapixel sensor with f/2.0 aperture and Face unlock support. The smartphone packs a 3020mAh battery and connectivity options include 4G VoLTE, Bluetooth 4.2, Wi-Fi 802.11 a/b/g/n/ac, USB OTG, FM Radio, GPS, and more.